DID YOU KNOW? World champion boxers Muhammad Ali and George Forman both began their careers in PAL boxing programs. 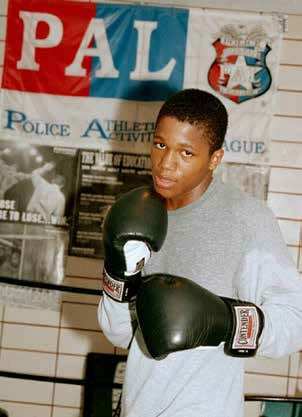 The Cleveland Police Athletic League (PAL) has a rich history in providing quality athletic, recreational and educational activities for the city’s younger citizens. Its purpose is to provide positive interaction between youngsters and police officers in a fun and safe environment, while focusing on physical fitness, healthy life choices, and becoming productive citizens. PAL provides opportunities for children in the community to participate in wholesome sports programs, recreational and extracurricular activities. By providing these services, PAL hopes to divert children away from negative influences and enhance a child’s individual self-esteem, self-discipline, and actualization. While there are similar programs for youngsters, PAL is the only one of its kind that provides positive daily interaction with police officers in the community in a recreational setting. PAL’s purpose is clearly stated in its motto, “Our Police Officers Helping Today’s Youth Become Tomorrow’s Citizens.” Many of the program’s participants have returned to volunteer and gone on to become coaches, police officers, and supporters. The majority of the approximately 1,000 youngsters ranging in ages 5-21 currently participating in PAL are from low-income families. Funding of PAL’s efforts is primarily derived from federal, state, and local grants and contributions from foundations, businesses and individuals. For more information, visit www.clevelandpal.org. 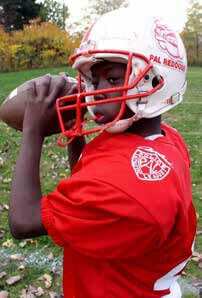 The Cleveland PAL Youth Football program has been in existence for over 50 years, and at one time had over 20 teams. Due to several factors but mainly funding challenges, the program today has four “PAL 6 Reddogs” teams: Termites (ages 5-7), Midgets (ages 8-10), PeeWees (ages 11-13) and Bantams (ages14-17). Each team consists of between 20-35 players, mainly residing on Cleveland’s southeast side in the Fourth Neighborhood Police District. Holding practices at Luke Easter Park near the Zelma George Recreation Center, they play their games throughout the City in the Cleveland Municipal Football League. Cheerleading squads consisting of 6-12 members in the same age groups lead crowd support for each team. When PAL Executive Director Robert M. Kumazec, Jr. learned from the coaches in their Youth Football program that many of the helmets to be used by the players did not meet current safety and concussion protocols, he was faced with quite a dilemma… delaying or possibly canceling the football season for as many as 55 kids, or find a way to raise the funds to buy them in very short order. Not wanting to disappoint the players and coaches, and not having the funds available in PAL’s treasury, Kumazec contacted the Cleveland Police Foundation for help. The manufacturer of the helmets used by PAL, Schutt Sports, was contacted and their representative advised that the company could offer the helmets at their cost. The CPF allocated some funds made available from a community engagement grant awarded to them by the Saint Luke’s Foundation, and the remaining dollars were allocated from another project the CPF was planning to fund. The order was placed and the helmets arrived in the nick of time, thus allowing the aspiring collegiate players to begin their season. On the day uniforms were issued, the kids were thrilled when they got a look at the new helmets displayed on the bleachers. They got a bigger kick out of the autograph session where they got to sign two helmets donated to PAL by Schutt Sports. They would be presented by PAL to the CPF and the Saint Luke’s Foundation in appreciation for saving the kids’ season. Our thanks goes out to Head Coach Bam and his dedicated staff for not only sharing their knowledge of football with the kids, but also reinforcing the importance of going to school, obtaining good grades and most of all, respect for themselves and others.